During a recent meeting at work, I was accused by my colleagues as being a control freak because I'd taken possession of both the remote control for the overhead projector and the air conditioning. Despite the fact that I was leading the meeting, they (all males) seemed to think it was because I wear the trousers at home and naturally assume control of the telly zapper and, consequently control the viewing of my household. Nothing could be further from the truth. Between 7am and 7pm, if the telly is on, it will either be tuned to CBeebies, football or cricket. With Miss A and the husband doing battle for supremacy if there is a conflict of interests. After 7pm, the husband is in sole control of what is shown on the lounge telly. It's one of about three things. Football. Reality TV. Or CSI/NCIS/Law and Order/insert other annoying American drama series in this space. I am sometimes permitted to join the viewing of programmes, provided I limit my commentary about poor continuity, improbable circumstances and '(s)he is the killer' (usually said within the first five minutes and proving to be correct fifty minutes later) to a minimum. Likewise, I get red-carded from the football if I utter 'Didn't he used to play for....? ', 'Isn't that....?' or 'xyz used to play for Southampton. All the good footballers played for Southampton once upon a time'. The only time I've ever been able to convince the hubby to watch something out of the ordinary was when I introduced him to Michael McIntyre. The husband doesn't do funny. Invariably, I have to explain jokes to him which then means they lose their humour. But one rare night when I did manage to get a hold of the remote, I tuned in to Comedy Roadshow and because MM was doing his routine about his kids and the husband now gets the harassed parent references, he actually laughed. And so once in a blue moon, I'm allowed to now watch that too. Of course, if I had my way, the viewing would predominantly include food programmes. And comedy. But certainly at the moment, mostly food. I used to love Saturday Kitchen (I have a thing for James Martin) but of course, now if I put the telly on on a Saturday, James is rapidly replaced by Justin (aka Timmy the sheep, Mr Tumble, Jake the Tweeny, the man from Gigglebiz etc etc....). When I was on maternity leave and snowed in (pre baby) I whiled away the hours watching so many back-to-back episodes of Come Dine With Me that I started dreaming about it. Now, I just fill the Sky box with episodes that never get watched. And so it will be no surprise to you that I've never seen Little Paris Kitchen. I know of Rachel Khoo because many of my Twitter friends have raved about her cooking and her amazing sense of style. I've read articles in Good Food about her. I meant to Sky + the series, but knew I'd only get to watch it if I got up at 2am to get my mitts on the remote. And then the dogs would probably pounce on me and insist on watching re-runs of Crufts or something. Today's recipe is by Khoo, but only because I was desperately Googling at 3am (couldn't sleep - should've caught up with CDWM back catalogue) to find something to do with the bunch of asparagus that was slowly wilting in my fridge, coupled with the now meagre other contents of the fridge which is being cleaned out in preparation for the holiday. Luckily, I managed to tick all of the boxes, save for lemons (purchased on the way to work). And even got further use out of my little pack of mint that I bought for Monday's recipe and used again yesterday. Am pleased with self for being thrifty and actually using up nearly a whole pack of fresh herbs rather than letting them wilt into submission. In fact, I should declare this as National Mint Week. Or 366 Recipe Challenge's Mint Week. Or ....Mint Four Days as I now only have enough left to cover tomorrow's recipe. Anyway, I'm aware that I've done a whole lot of waffle and so without further ado, this makes a really lovely starter (or main if you're greedy like me) and brings out the best in seasonal asparagus with a few simple ingredients. Will definitely make again and again. I just love asparagus and goats cheese. It pressed all my buttons. 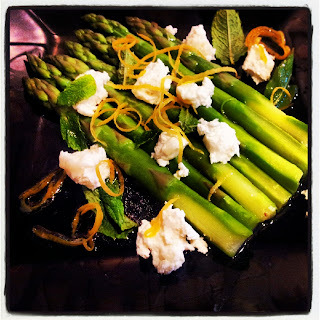 Only had regular green asparagus, and I used a crumbly Chevre with it. Served with the last bit of the foccacia I made the other day. Winning tea.